The new specials brought the show full circle... and started something new. 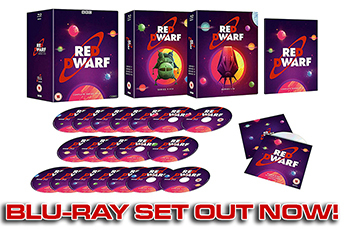 With the return of Red Dwarf planned for the 20th - and eventually 21st - anniversary of the show, it's unsurprising that the makers would put some effort into celebrating the previous eight series. 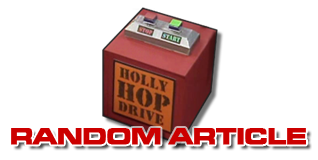 What is interesting is the way careful homage was paid, while at the same time the show refused to get bogged down in show lore. 'Nine Years Later' the caption at the start tells us - and that's all you're getting. So on the one hand you have the monster of the piece being a female match to Back to Reality's despair squid, the crew tracking a clue via a snake scale from the transformed polymorph. The Matter Paddle is referenced, along with the time slides and the Holly Hop Drive. Kryten even tugs on the old familiar water wings. Plenty of Easter Eggs for the initiated. On the other hand - 'Nine Years Later'. To hell with a decade-old cliffhanger that had infuriated parts of the fanbase, this is about telling a brand new story. And, just like that, we're back on warm, comfy territory - kicking off with Rimmer and Lister bickering just as they always have. There was a lot to like about the tone of the story, too. As in Queeg, a member of the crew is proving incompetent and a replacement is drafted in. There's always a certain chemistry when Rimmer gets a female hologram to spar with - as we learned from Holoship, Camille and, well, his female equivalent in Parallel Universe - and this was no exception. Katerina Bartikovsky changed everything. What's especially interesting about all this is that these interlopers often turn out to be not quite what you expect. 'Hologram Camille' was a snot-looking GELF and Queeg was... well, he was Holly. Playing a joke and making a point. Another familiar Red Dwarf trope is the places the boys go to get themselves into mischief. New dimensions, alternative realities and time travel have all played a huge part in the show. Here, somewhat brilliantly, the crew believe they are sent to an alternative dimension, centuries past, when in fact they're in an alternate reality. Can you say 'mash up'? Back to Earth plays with its own genre - a long way, now, from riffing on other SF books and movies. It shows you a Backwards-like trip through a wibbly thing to a past Earth where our boys are notably out of place. So far, so Red Dwarf. Then the reveal - this alternate dimension isn't just 'a bit different', it's a place where the boys are characters in a TV show. Which can mean only one thing: evil twins. Or, at least, alternate personalities in the Ace Rimmer/Duane Dibbley mould. A chance, surely, for the cast to once again play on either side of the split-screen. 'Play with themselves', if you will. Well, play they did. 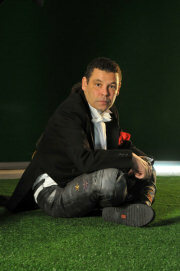 But the alternative Lister turned out to be... Craig Charles. It's both totally Dwarf and totally different. Of course the truth was eventually revealed and we smacked our foreheads: this was a squid-induced hallucination. The real answer for everything - as mirrored in the endings to Better Than Life, Back to Reality and Back in the Red - was yet more old-school Dwarf, disguised by two previous old-school devices. All in the pursuit of a story about identity and meaning, about a character finding his purpose once again - realising he has support even as his fans support him. Meanwhile, though, we still have that pesky refusal to fill in the gaps. What version of the Dwarf ship is this, all squat and old-style? What version of Rimmer are we looking at, now he's a hologram again? (Dialogue suggests that this is the return of the man who tried to be Ace, which makes you wonder if the gonad-clutching Death didn't finally catch up with the old 'fleshy' Rimmer after all.) How did we get here? Back to Earth ain't saying. And while Doug Naylor may yet have interesting answers up his writerly sleeves, for the time being it doesn't especially matter. After all, it is a TV standard to hit the reset button at the end of an episode. To a greater or lesser degree, especially among sitcoms, events are contorted to bring the status back to quo at the end of the half-hour. So, y'know, just assume it all worked out. After all, Red Dwarf has a tradition of riding roughshod over its own cliffhangers. Series II pregnancy? Dealt with in a high-speed caption viewers at the time were unable to read. Series VI explosion of Starbug? A quick video diary and move on. Rimmer exploding after being restored to life? Kryten being left as human while Holly can't work the DNA computer correctly? The most truly surprising thing about Series VIII opener Back in the Red wasn't the resurrection of the crew. It was the way the story picked up mere moments after the previous series ended to conclude the cliffhanger. The joke being that we'd happily have assumed that Red Dwarf - and Lister - would have been nano'd down to size in the interim. We didn't know it was a cliffhanger at the time. Red Dwarf: only resolving its cliffhanger endings if it doesn't have to. And then the backstory comes up. 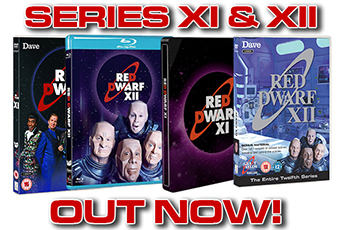 But nothing about nerd-gap-filling ship re-sizes or Rimmer returns. This wasn't exposition, it was about where the the characters had landed now. Kochanski has tragically died, sucked out of an airlock while Lister was taking a bath. (Seriously, what were the odds...?) But by being unseen, this second-hand story was open to question - and Lister's subconscious doubts finally crept out and spoke to him... in the form of two kids on a bus. Did she die, or had she just left the last man alive? One of the keys to Back to Earth's success dramatically was the return of the more human aspect. The emotional content of Series VI, VII and VIII was a lot lower than what had gone before. The softer, more subtle drama seen in episodes like Dimension Jump (Lister chats to Ace while the latter sews up his own arm) and Better Than Life (Rimmer informed of his father's death) had slipped away, and even basic 'big love stories' like Camille and Holoship seemed gone for good. So the new special takes hold of the smaller, human drama and the epic love story, runs them through the wash like a red sock with a pink shirt, and applies the resulting pinkness to the new show. On the one hand, you get the kind of Lister-Kochanski dynamic the series had often promised but never fully got to grips with. By using the regular Kochanski actress rarely and specifically - not unlike the plan in the first couple of series - while telling a story of loss and regret, viewers were left with a distinct prickle behind the eyes come episode three. In starting the show with a grief scene Back to Earth went full-circle to The End. That original script, lest we forget, kicked off a comedy series with not one but two 'funeral' scenes. The post-accident Kochanski scene may not have made the final cut... but here, 20 years later, is an interestingly reduxed version of it. In this, as in other areas, Back to Earth was as much reboot, new pilot, as it was potential final bookend for the series. It made the show 'Lister's story' once again. Lister is returned to a state of loss before rediscovering his mission in the final act - pursuit of a home, of happiness and of the woman he loves. Look out Earth, this visit may have been a near-miss, but the slime is still coming home.